Looking for an Escondido Bartending School? Professional bartending school serves Escondido, California among other north county cities. The classroom is located off the 78 and offers behind the bar training school approx. 20 minutes from Escondido. Since 1983 we have graduated bartender students who work throughout north county and San Diego proper. Escondidio is perfectly located off the 78 and 15 freeways. Those that live in Escondido are treated to being centrally located to attractions, mountains, coast and deserts. Surrounding the city is San Marcos, Fallbrook, Valley Center and Rancho Bernardo. For a things to do on a typical day, a resident has the choice to nearby Wild Animal Park, taking a scenic drive to Julian or Palomar Mountain. Some of the most popular casinos in the state are a short drive away. Residents here enjoy many benefits of living so close to a varied amusements and major freeways. 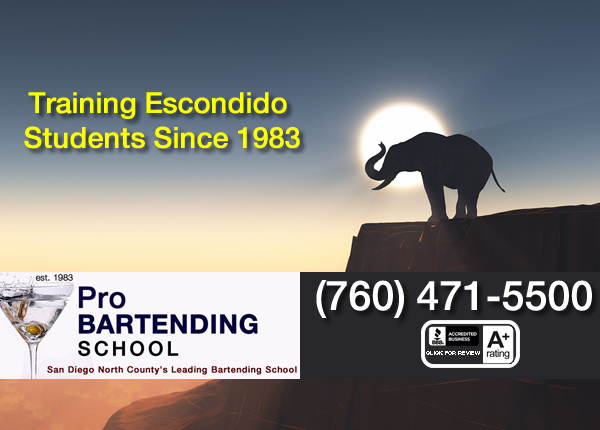 Click here for the Escondido Bartending School Class Schedule or Call: (760) 471-5500 and speak to an admission staff member.